The celebration of the life of former Aberdeen midfielder, who went on to manage Ross County, Gillingham, Hartlepool United and Peterhead, produced tears and laughs as friends and colleagues joined as one to remember the man known as Tattie, who died on May 30 following a fall. Aberdeen stars of the past gathered alongside supporters and Cooper’s family to remember a man whose warmth and humour left a lasting impression on all who met him. Several of Cooper’s team-mates from his time at Pittodrie – Scotland manager Alex McLeish, his predecessor Gordon Strachan, former Dons boss Mark McGhee, Eric Black, Peter Weir, Stuart Kennedy, John McMaster, Doug Bell, Ian Angus, John Hewitt, Bryan Gunn and Neil Simpson – were in attendance for the ceremony which was hosted by broadcaster Richard Gordon. Balloons were released at Pittodrie last night as a tribute. Cooper’s son Alex, who has followed in his father’s footsteps in football, spoke along with his nephew Doug Blake on behalf of the family. Cooper, who plays for Fresno FC in the United States thanked the emergency services for their efforts in treating his father and thanked representatives of all the clubs associated with his dad. He said: “It has been humbling for the family and we’re really grateful. It’s amazing to see such a turnout. The family are really grateful to each and every one of you who has come here and shared your messages about what he meant to you and his dirty tackles and warm heart. Willie Miller, who was Cooper’s captain in his biggest achievement as a player, the Cup Winners’ Cup final win against Real Madrid in 1983, hailed his former team-mate as the spark of the dressing room during his time at Pittodrie. 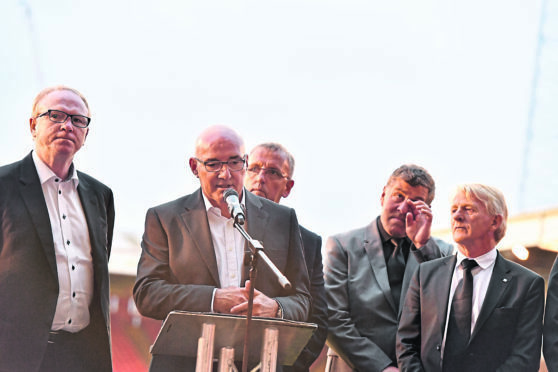 Neale Cooper’s former teammates including Willie Miller, Alex McLeish, Mark McGhee and Gordon Strachan were among thousands who gathered to pay tribute. But the biggest laughs came from Cooper himself with video footage of some of his famous tales from his career while former Don Charlie Nicholas, who was on the receiving end of an infamous challenge from Cooper just three seconds after kick-off while he was at Celtic, led the video tributes as he recalled the challenge. Archie Knox, who was Sir Alex Ferguson’s assistant during the club’s dominant period of success in the 1980s was joined by Aberdeen director and former manager Craig Brown in sharing their memories, while Andy Dornan, Cooper’s former team-mate and assistant, did likewise. Dornan told of Cooper’s encounters with Huey Lewis, Michael Elphick and Paul Simon during his time at Aston Villa. Joe Harper, all-time leading goalscorer at Aberdeen, gave a touching tribute to his close friend. 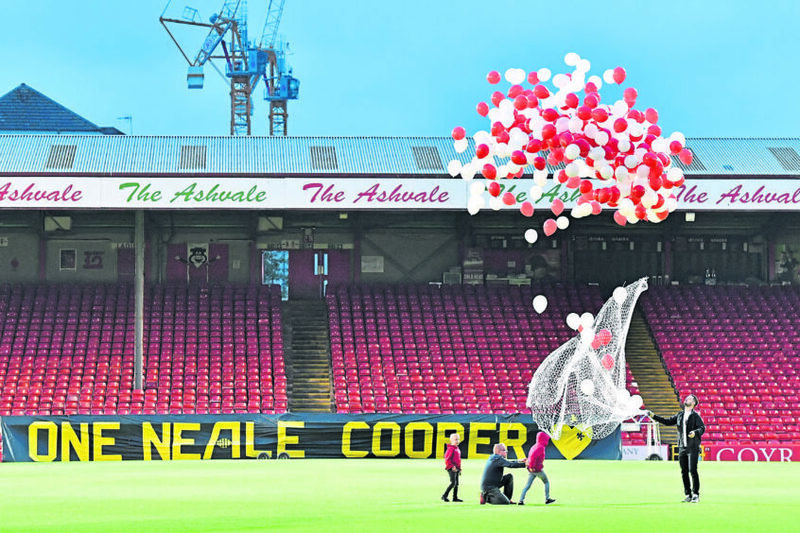 The poignant and emotional celebration concluded with the release of 220 red and white balloons in recognition of Cooper’s appearances for the Dons, followed by a minute’s applause for the Gothenburg Great.